This definitely isn't the retractable canopy like in the infant car seats - it's either on or it's off: no adjusting. Happily, it goes on and off very easily. ConsNot in any way adjustable; Creates a blind spot in the vehicle. I thought this would be a good idea, but I can't see my daughter in the mirror when it's being used, and it doesn't seem to help keep sunlight out of her face. It just sits in the back of my SUV. ConsDoesn?t keep sun out of child?s face. Blocks view, so I can?t see my child in mirror while driving. Gets in way when putting kid in seat and taking them out. Best UsesIf light primarily comes into vehicle from the side window (does nothing for rear window light). It does the job of blocking the sun. Its thick but can bend/fold over to put baby in without taken off. Slides on easily. Keep the metal of the car seat semi cool. ProsLots of extra shade and makes it very cozy for when she falls asleep in the car. ConsIt doesn't collapse backward gracefully at all! It's bulky and annoying to have it attached and getting baby in and out of the seat. I end up getting frustrated and just pull it off to get my baby out or put her in her seat. This was so easy to install and works great! What a great product! Best UsesPerfect for keeping the sun off the child. It helps at certain times of the day but it doesn't always block the sun. This car seat is FAB!!! The material is so soft and plush. It isn't the kind of material that heats up, which is perfect for here in the desert!!!!! ProsExtras*** Ok... So I purchased the extra shade for the top of the car seat and it is amazing!!!! It completely blocks out the sun and it is super cute! Must have!!!! I love that this canopy is offered because I was hesitant to transition my daughter from her infant seat as she hates the sun in her eyes. This solves the problem and is very easy to install (no hooks or anything, it has flaps that basically tuck between the seat and headrest). I do find that it is difficult to maneuver your child in and out of the car seat without removing it first but I don't find it a huge issue. Would recommend. Nice canopy and very easy to install, gives perfect amount of shade to my daughter facing front or back. Will this work with the Pria 85 Max? Does this work with Maxi-Cosi Magellan? Per Maxi Cosi, this will not be compatible with the Magellan seats. Hi, I have Maxi-Cosi Pria 85, Does this canopy works with it? Thanks. 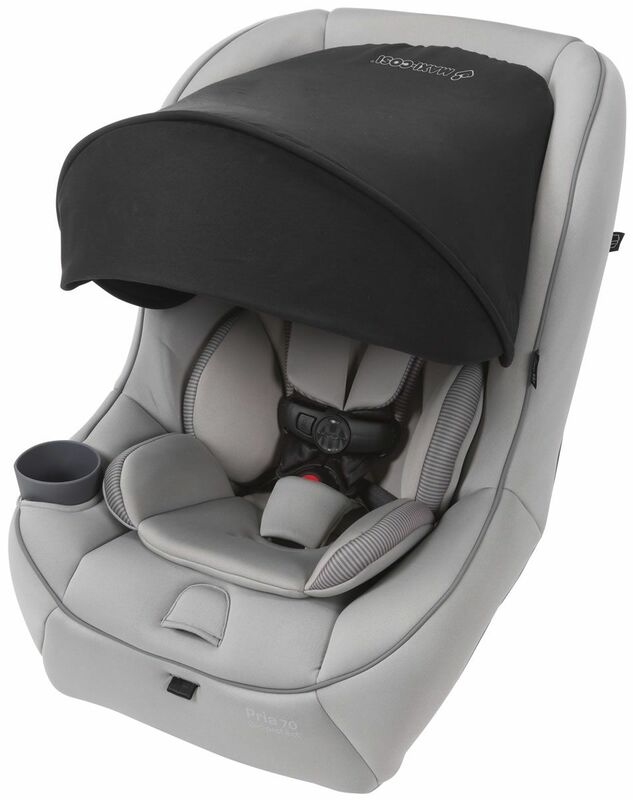 Your baby will enjoy your rides together even more with the Cosi Convertible Car Seat Canopy. It secures easily into place on both Vello and Pria Convertible Car Seats to block the sun and provide a rear-facing child some welcome shade. It also features a flip-out visor that lets you extend the canopy further for extra protection when needed.